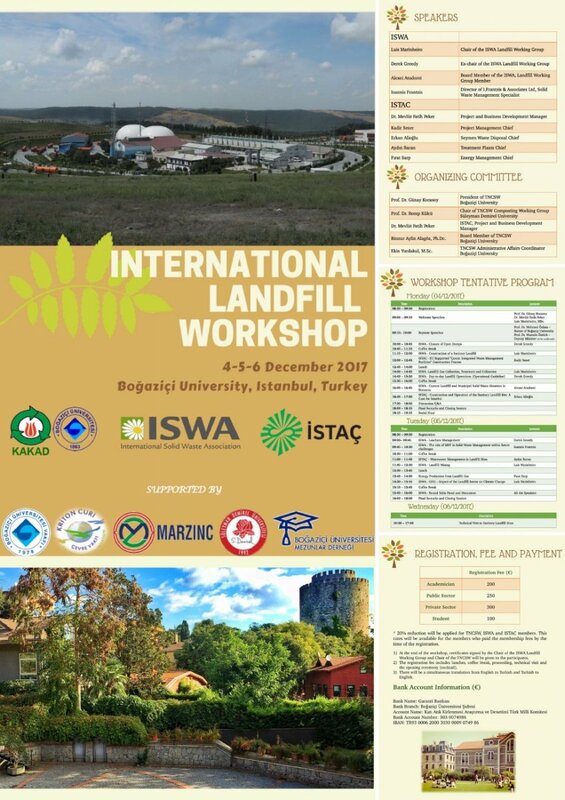 The International Workshop is organized by the Turkish National Committee on Solid Wastes (TNCSW), International Solid Waste Association (ISWA) and ISTAÇ Inc. with the strong support of many national and international institutions aiming to demonstrate the key areas and critical issues to be considered in construction, operation and maintenance of landfill. Landfill remains as the widely applied disposal technology for waste management worldwide and is likely to be so for the foreseeable future particularly where open dumping remains current practice. Many countries are still experiencing difficulties and it is clear that in countries where open dumping is current practice, there are always environmental pressures as well as health drivers to move towards the sanitary landfill. This training workshop, through two-day keynote speeches and oral presentations by Chair of the ISWA Landfill Working Group Luis Marinheiro, ex-chair of the ISWA Landfill Working Group Derek Greedy and chair of the ISWA Southeast Europe, Middle East and Mediterranean Countries Regional Research Network Alexei Atudorei and Director of I. Frantzis & Associates Ltd. Ioannis Frantzis. The existing situation landfill operations and developing trends in Turkey will be presented by ISTAC Inc., authorized waste company Istanbul Metropolitan Municipality; Project and Business Development Manager Dr. Mevlüt Fatih Peker, Project Management Chief Kadir Sezer, Erkan Alioğlu, Aydın Baran, Fırat Sarp. The workshop also address operational guidelines, including recycling, leachate management, gas recovery and case studies from Turkey, Europe and the World through which participants will be able to see how a sustainable integrated sanitary landfill is operated in practice by attending to a technical tour. The training course will be of benefit to participants especially from economically developing countries as well as those already operating landfills in economically developed countries to learn and provide truly sustainable landfills.